Feeding a Puppy - Eat to Live, not Live to Eat! Feeding a puppy may seem confusing at first. Everyone tells you that their food is the best, some say go grain free, others say a raw diet is the way to go, and others swear by the no name brand kibble. Just as in humans, if a pup is fed a lot of "junk" food, it will show in their weight, quality of coat and skin, breath and dental health. Wow! That puts a lot of pressure on you, as owner, to make sure that your pet gets the best diet possible! Depending on your dog or puppy's activity levels, they need both protein as well as fatty acids, vitamins and minerals. Sound like more work than you thought? Well, lucky for you, feeding a puppy or adult dog doesn't have to be hard work. While many commercial dog kibbles say that they contain all these necessary elements, they also are highly processed, cooked, and contain grains and other unneeded carbs. Dogs DO NOT need carbohydrates as they are carnivores, not omnivores. I personally recommend feeding dogs a raw dog food diet, consisting of meat, bone, and organ meat. There are so many benefits of feeding raw, that it's no wonder so many owners are switching their dogs over from kibble! And don't worry, raw food is completely safe for puppies to eat as well as adult dogs. This is the most important time in your dog's life. Their little bodies are growing, and now is when their skeletal, immune and other systems develop and mature. The biggest mistake many people make is over-nutrition (or over-feeding). As a puppy, this won't necessarily make them fat, but it will make them grow very quickly. How is this a problem? Well, a puppy's bone growth can't keep up with the growth of their body mass... which means that while they may look healthy and big, their bones are weak. This in turn causes serious skeletal problems, either early in life or later on (i.e. hip dysplasia). It's always better for them to grow slowly and steadily, giving their bones the chance to grow strong and dense. Never let your puppy "graze" all day long! As for how to feed, never let a puppy "graze" all day. Obviously, this is related to feeding kibble, as you wouldn't leave raw meat out for that long. You should be feeding a puppy in portions several times a day, so that you can monitor how much they are consuming, and record their weight weekly. Fresh water should always be available. Adult dogs can eat 2 - 3 times per day. Dogs need and benefit from routine. It might sound boring to you, but your puppy is happiest when he knows exactly when he'll be fed, walked, and played with. A routine helps keep a dog calm and free from stress, and therefore healthier! Obesity in dogs is a common problem, especially for kibble-fed dogs. And while it doesn't happen overnight, it can be hard to detect in the beginning stages. What you are feeding your puppy now will determine what your dog will look like later on in life. Look at your dog from the side. Check if his tummy is tucked up against his body. If it is flat or hanging, he/she is over-weight or obese. Look at him from above. You should be able to see an hour-glass figure from his ribs to his hips (an obvious "waist"). 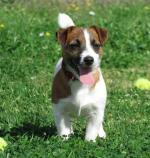 If your dog is equally broad throughout this area, or his belly bulges out, he is over-weight. 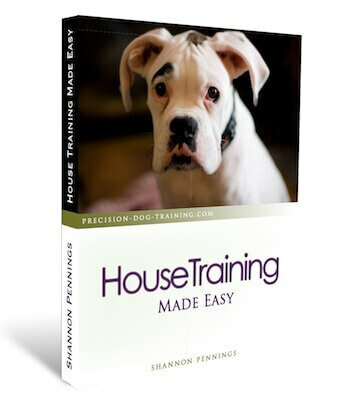 Run your hands lightly down the dog's sides from shoulders to hips. You should be able to feel his individual ribs. If you can feel fat over the ribs, or need to press down in order to feel them, your dog is obese. Obesity will shorten your dog's life, and heightens the risk of cancer, heart disease and diabetes. How can you keep him/her at ideal body weight? Feed proper amounts of food (no grazing! ), give plenty of exercise and watch what you feed as treats. Raw meaty bones, chicken or turkey necks, dehydrated beef liver, and grain-free organic treats are all good choices. You will need to change the amount you feed your dog occasionally. Things that influence your dog are age, activity levels, and breed size. You won't always be feeding a puppy - he will grow up fast! You should feed your puppy or dog in stainless steel bowls as opposed to plastic, especially if feeding raw. They are easier to keep clean (just pop them in the dishwasher each day), and plastic bowls can give your dog "pimples" under their chin. Some large breed dogs will be able to digest their food easier if fed in raised bowls. Water is very important for a dog. They get rid of excess heat by panting, and this loss of fluid needs to be replaced by drinking. In the summer especially, make sure your dog has plenty of water all the time. In the winter, they still need water (not snow...) as the cold can make them dehydrated quickly. Believe it or not, a raw fed dog drinks less water, as their food is very moist in comparison to kibble! 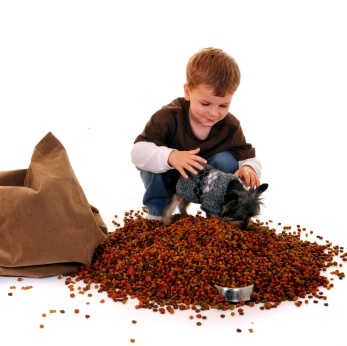 Remember, this is simply an overview on nutrition and guidelines for feeding a puppy or dog. Always get advice from your pet nutritionist or a holistic vet if you are unsure about something! Unfortunately, most conventional vets are not in favor of raw dog food, mostly because they only receive about 4 hours of nutritional education in school (and this coming from dry dog food companies!). Your best bet? Find a good holistic vet in your area who will support your decision to feed raw.